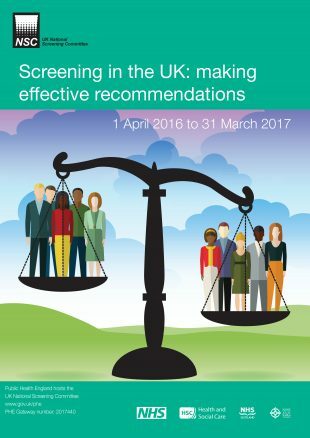 The UK National Screening Committee (UK NSC) makes recommendations on all aspects of population screening. The UK NSC makes recommendations on more than 100 conditions, including recommendations to screen for more than 30. Recommendations on whether to screen for a condition are based on internationally recognised criteria, a rigorous evidence review process and consultation. The UK NSC meets 3 times a year to make new recommendations or update existing ones based on reviews of the best quality evidence available at this time. Today, we published Screening in the UK: making effective recommendations 2016 to 2017, which summarises all the screening recommendations made between 1 April 2016 and 31 March 2017 and the evidence behind those recommendations. The report outlines how the committee has worked more closely with patient groups, charities, royal colleges and other external organisations through its annual conference event with stakeholders, our first ever annual call for topics and the rapid evidence review process. In his foreword to the report, UK NSC Chair Professor Bob Steele also explains how the committee has been strengthening its approach to ethical issues and informed choice. I’d thoroughly recommend giving it a read. It puts all the work we do into context and emphasises the importance of high quality evidence for any population-based screening programme. I’d like to take this opportunity to thank Bob, the UK NSC secretariat, stakeholders and academics for all their hard work and support. Without them, we wouldn’t have been able to complete such a large amount of high quality work.